TexTube® is a tubular-knit, two-ply tube constructed of 100% polyester. Achieves the maximum sorption of all sealed-edge wipers. The two open edges are thermally sealed to prevent particle and fiber release. 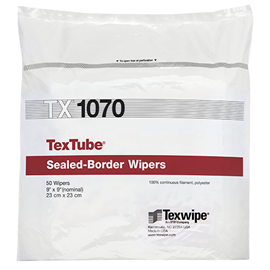 The TexTube® wiper offers high sorptive capacity and excellent contamination control.